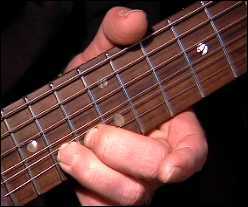 Michael: Our scale for this lesson is in the Db Minor Pentatonic scale Db, E, Gb, Ab, B, or you can consider it C# as well. Michael: Here's a jam track to play over. 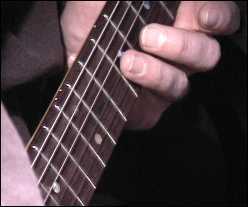 Michael: Notice you start with a whole step bend, make sure you use the 2nd and 3rd fingers together to make a proper blues bend. 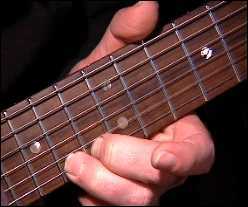 Michael: This scale pattern will help explain the extra note(s) used in the last lick. Teacher: Notice how the first bend is a half-step bend, instead of a whole -step, it comes alive when playing over the jam track. Michael: Notice the bends in the 2nd measure. You build on the bending steps, 1st standard, 1/4 step, 1/2 step, whole step..... very cool lick and common with Albert King. Michael: See how they build? Michael: Notice how it starts in the 1st Db min pen scale pattern..... then shifts up to the next Db min pen pattern. 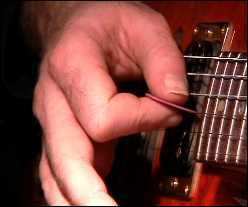 It sounds very cool and adds dynamics to the lick. I can tell you are all playing when you're quite like this. 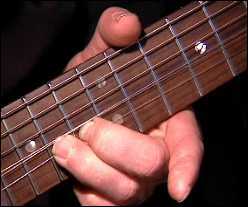 John: how do you mute strings around the note you are trying to play? Michael: With either the palm of my picking hand John. 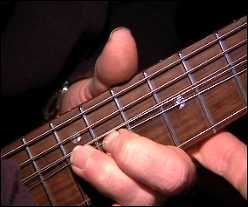 Michael: Or laying my fret fingers on top of the lower strings. Michael: Here's lick number 6.